So, here it is. 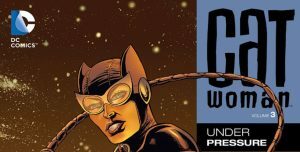 Ed Brubaker’s final stint as Catwoman writer and the story continues with Selina’s crusade to get the East End of Gotham back on its feet with the help of her friends Leslie Thompkins, Slam Bradley, Holly and Karon. However, unlike Trail of the Catwoman and No Easy Way Down, Under Pressure is much more solo and a lot less teamwork as she starts to hit the big guys to finally bring down Junior Galante. Collects Catwoman #25-#37 so a fairly decently sized collection. There are 2 pure Catwoman story arcs included which is Under Pressure and Out of the World which are the real sequels to Trail of the Catwoman/No Easy Way Down and then the rest of the books are shorts which are the War Games tie ins. Let’s start with Under Pressure. 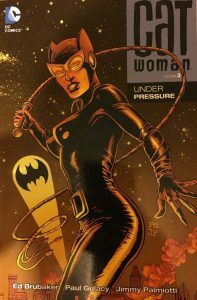 Under Pressure is a great 5 issue storyline where she goes after the big guns in the East End mafia in an explosive way, Selina has clearly had enough of the East End constantly being picked on by those in power and she decides enough is enough. What ensues is an ultra tense battle between Catwoman and Zeiss who is more than a match for her. To the point where she was almost killed. Although I much preferred the style in the two volumes before with a slower pace, much more dialogue and not as much action I still enjoyed the arc. 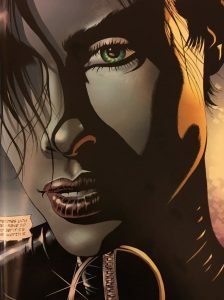 Zeiss although not too original of a character still got a lot out of Catwoman in terms of character development as we see Brubaker write her as a strong willed, never say die character. Art was pretty good too even if it seems like marmite on sites like goodreads and comic book roundup. 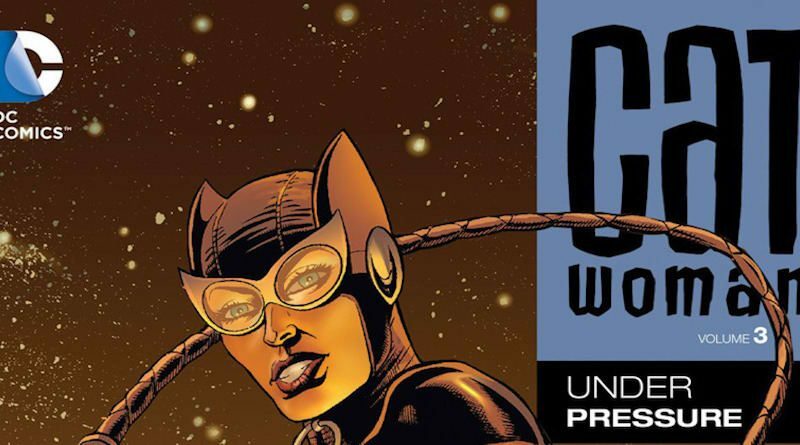 Brubaker’s world for Catwoman is fully built now so I can see why the direction changed. Slam, Holly, Leslie and Karon’s roles have been established so there’s nothing left but to push Catwoman. Does it show at this point? Yes it definitely does but it’s enjoyable nonetheless. Gulacy joins the team at this stage and you can see the art is much modernised three volumes later. I preferred the way it was drawn in volume 1 above all but otherwise no real complaints. Following the shock ending of Under Pressure which I won’t spoil comes Out of the World. This is a very short story on where Catwoman is after Under Pressure. I was never a fan of the whole Beti-Ma thing in the previous volume and I wasn’t a fan of this one either. 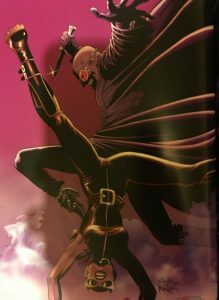 What it has given though is the artists an excuse to draw Catwoman in skimpy clothing and a few fight scenes showing just enough to pique some fans’ interests. Not a big fan of this at all but it was very short so I will let them off. Readers then get some one off issues with Holly which are decent enough filler issues, a very well written Slam issue who meets up with his estranged son. The rest of the book is then just War Gams tie ins which feel like they’ve been shoved in against Brubaker’s will. I have read War Games (volume 1 and volume 2) and enjoyed them so I had a good idea of the context…but! in the context of Under Pressure there is absolutely no context given whatsoever about what’s gone on before or during War Games and it is a hideously disjointed experience, especially if you’ve not read War Games. It just doesn’t make sense and you are thrusted into mid War Games stuff without any warning. Inside the War Games collections these are decent enough issues, not great but good enough, but in Under Pressure they are awful, lazy and offer a very bad experience and it undoes all of Brubaker’s careful world building and character building work. I would suggest reading my War Games review for Catwoman’s parts as they just don’t belong here and I have to mark Under Pressure down because of this. The worst part of it? Brubaker doesn’t conclude the overall storyline as Will Pfeifer takes over in the next volume. Where the War Games tie ins were should have been his final 1-2 story arcs to give readers proper closure. Overall, Under Pressure is an OK book. The parts where Brubaker is in control are good if inconsistent at times with the earlier work. 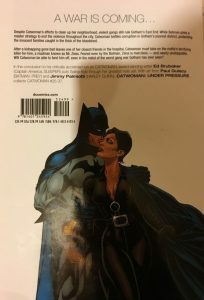 The artwork is refreshed and modernised in line with other DC comics at the time. However, the War Games tie ins included in the book are forced and offer no context which seriously hamper the pacing and enjoyment of the book.